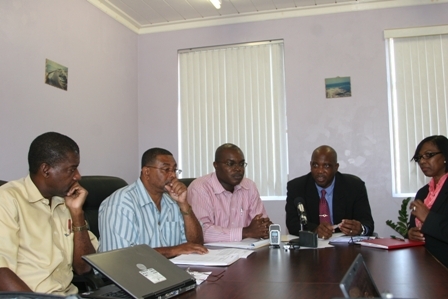 NIA-CHARLESTOWN NEVIS (February 09, 2011) — Reports of contamination in sectors of the public water system, has been described by Minister responsible for Public Utilities and the Environment on Nevis Hon. Carlisle Powell, as a red herring that was much ado about nothing. He said it was simply a tactic used by critics to detract from the successes of the Nevis Water Department in recent years. Mr. Powell accompanied by his Permanent Secretary Mr. Ernie Stapleton, Permanent Secretary in the Ministry of Health Mrs. Joslyn Liburd, Manager of the Nevis Water Department Mr. George Morris and Chief Medical Officer in St. Kitts and Nevis Dr. Patrick Martin, said at a press conference in Charlestown on Monday, that the development of water had been a major success of the sitting Nevis Island Administration (NIA) and they would not be deterred in their continued efforts to provide the island with a modern water quality system. “This is much ado about nothing, very much ado about nothing. Our water remains safe. We believe that this is just a red herring trying to detract from the successes of the Nevis Water Department, who have over the last four and a half years put into the system over one million gallons of drinking water per day, to the extent that people in Nevis now have water 24 hours a day seven days a week. This is a Water Department that has over the last two and a half years connected more than 100,000 feet of new pipe throughout the system as we continue to develop the water system in Nevis. “Water is one of the major successes of this government [and] this is just a red herring. We will continue to serve the people with very great skill and determination. We have coming on stream now a $30million Caribbean Development Bank /Nevis Island Administration Water Development Project,” he said. According to Mr. Powell the loan to facilitate the project was signed last week by Premier of Nevis and Minister of Finance Hon. Joseph Parry. “We are poised to make what has been a major success into a magnificent success story of this government. So this will not detract us in our search forward to providing for the people of Nevis more water better quality water and at the same rate we have been providing people,” he said. In addition Mr. Stapleton disclosed that a master plan for water had already been developed and instituted for the water sector on Nevis and in direct relation to the water quality significant progress had been made to improve the system already in place. “As a matter of fact we have been fortunate to the Nevis Water Department in collaboration with Caribbean Environmental Health Institute (CEHI) and there are a couple other projects. “In that particular project we will be getting some additional equipment with regard to testing the water quality and also our system of chlorination will be improved upon in terms of what is happening in the modern world with regard to those issues. So there is a plan not only to … but on the quality side we are also going to provide a modern water quality system for Nevis,” he said.